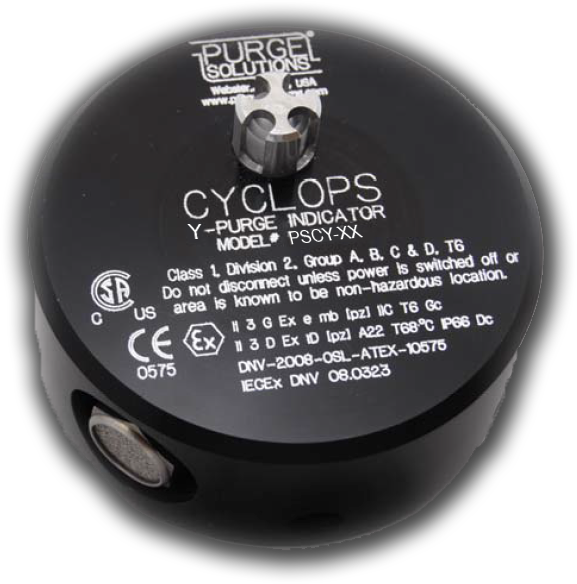 The CYCLOPS Y - Purge Indicator for use in Division 1 and / or Zone 1 hazardous areas, which monitors purge pressure in one (1) pressurized enclosure. Type "Y" purging reduces the classification within a protected enclosure from Division 1 and / or Zone 1 to Division 2 and / or Zone 2. Requiring all equipment in the protected enclosure to be approved for Division 2 and / or Zone 2 hazardous area locations. For Y type purging; failure to maintain pressure within the protected enclosure is detected locally by a green LED visual indicator and for required remote monitoring a dry contact is standard on the CYCLOPS Y - Purge Indicator. The dilution purge time is a manual operation and once the enclosure has been purged of ignitable or flammable concentrations, only positive pressure is required to be maintained within the enclosure and it is not necessary to remove power from the protected equipment upon the loss of purge pressure. The enclosure exhaust vent is an integrated part of the CYCLOPS Y - Purge Indicator casing, which comes standard in anodized aluminum and as an option in 316 stainless steel, with voltage options in 12 or 24 VDC. The CYCLOPS Y - Purge Indicator mounts directly to the enclosure being purged. This means no additional holes, sheet metal, or plumbing is required for installation of the CYCLOPS Y - Purge Indicator. The CYCLOPS Y - Purge Indicator provides an objective evidence of the presence of adequate positive purge pressure above 0.20 inches of water column (0.50mbar) from a single pressure point within electrical equipment enclosure. When the monitored enclosure registers a pressure of at least 0.20 inches water column (0.50mbar) above the reference atmospheric pressure surrounding the enclosure, CYCLOPS's local green LED indicator will light up. A manually controlled time delay may then begin. Typically, a minimum time delay is specified to ensure that at least five (5) times the volume of free space in the enclosure is exchanged before power is manually applied to the electrical equipment being monitored by the CYCLOPS Y - Purge Indicator. After the manual time delay has elapsed and the CYCLOPS's local green LED indicator light is still illuminated, showing that the monitored enclosure pressure is being maintained above 0.20 inches of water column (0.50mbar), power may be manually applied to the electrical equipment within the protected purged enclosure. Purge Solutions, Inc. CYCLOPS Y - Purge Indicator is certified to ATEX, IECEX, NEC/NFPA, UL, CEC and CE Mark standards or guidelines by recognized third party notified bodies for use in hazardous areas worldwide.